“Income” trading has become wildly popular for option traders since the global financial crisis. This style involves selling out-of-the-money options to a hedger and collecting the full premium payment at expiry — assuming the underlying doesn’t trend too hard in one direction. But if you’re willing to go against your innate biological wiring it’s possible to make a good chunk of change by doing the opposite — buying deep out-of-the-money (DOTM) options that seldom win. As long as the winners earn multiples of the losers it’s possible to walk away with a profit — despite the low win-rate. To win as a buyer you must carefully select DOTM options that have the best chance of upsetting the implied distribution of the Black-Scholes pricing model. Black-Scholes for the most part works pretty well. But it has a flaw, the model assumes that momentum doesn’t exist. This assumption holds up just fine in the short-term. But it breaks down badly in the long-term. As market practitioners we know that momentum, of course, does exist. And we know also that momentum becomes even more pronounced the longer the time-frame. 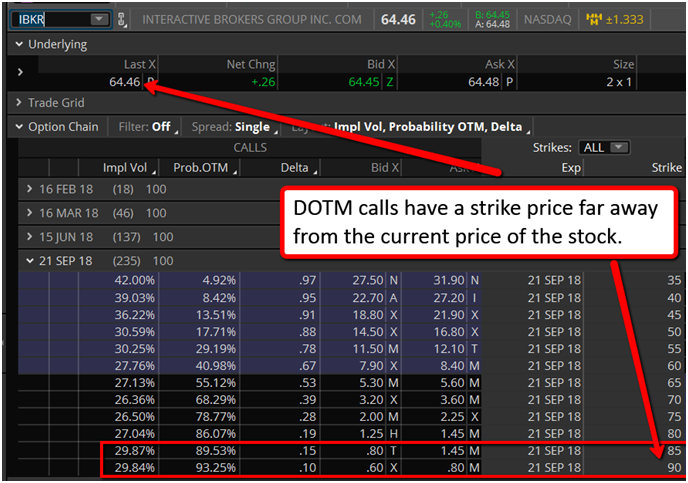 So there’s a profitable trading opportunity if we buy DOTM options with many days left to expiry and allow the underlying enough time to drift pass the strike price. Jim Leitner — one of the most successful global macro traders of all time picked up on this long ago. He talks about the mispricing of long-dated options in his 2006 interview with Steven Drobny (emphasis mine). Longer-dated options are priced expensively versus future daily volatility, but cheaply versus the drift in the future spot price. We need to make a distinction between volatility and the future drift of the currency. Since the option’s seller (the investment bank) hedges its position daily, it makes money selling options. Since some buyers do not delta hedge but instead allow the spot to drift away from the strike, they make money on the underlying trend move in the currency. So both the seller of the option and the buyer make money. The profit for the seller comes from extracting the risk premia in the daily volatility, and for the buyer it comes from the fact that currency markets tend to exhibit trending behavior. If the option maturity is long enough, trend can take us far enough away from the strike that it’s okay to overpay. Although his specific observation has to do with the forex markets. The same logic can be carried over to the equity markets — where our DOTM (deep out of the money) strategy focuses. Hot stocks have a tendency to drift (ie, trend) for long periods. They don’t follow a random walk as the Black-Scholes model assumes. Knowing this, our go-to DOTM option strategy is to buy low delta calls 4-12 months out in time on high momentum stocks. A momentum stock can cause DOTM calls to appreciate as much as 64x of the original price…Here’s an example of that from one of our stock picks from the summer of 2017. In August of 2017 we became interested in Interactive Brokers for fundamental and technical reasons. At the time IBKR traded for $40.54. 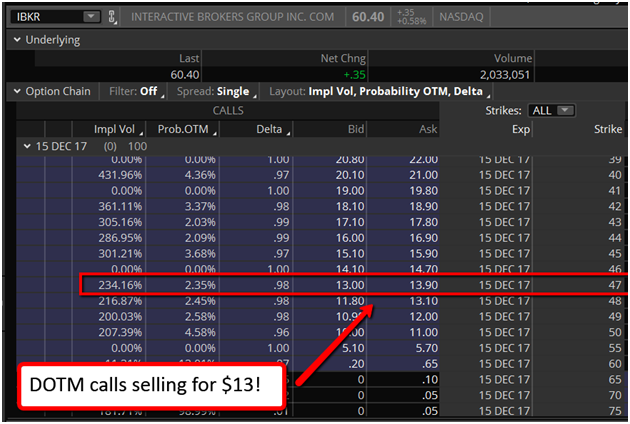 The December DOTM call options struck at $47 were trading for just $0.20. By December 15th, IBKR was trading for $60.40. A 49% gain in a few months. But take a look at the price of the 47 DOTM calls. The Black-Scholes model massively mispriced these calls. A return of that magnitude should rarely occur. But we see it happen again and again in the long-dated DOTM calls of high momentum stocks. Here’s another more recent example from DOTM calls in Twitter. 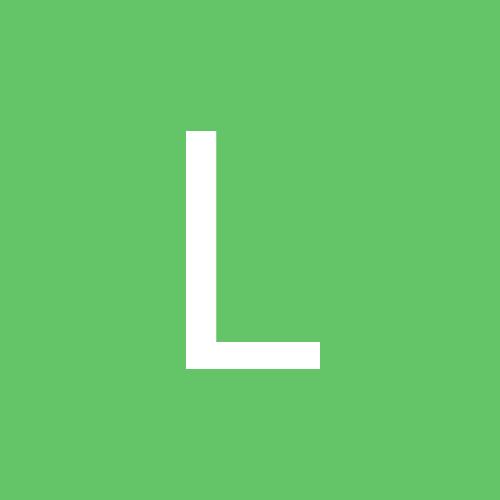 Twitter started to run out of its base at the beginning of 2018. By summer stockholders had been rewarded with a nice 77% gain. 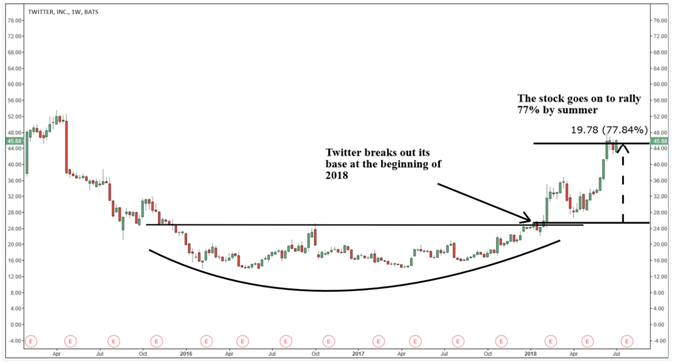 But check out the June DOTM calls on January 12th, the day of the breakout in Twitter. These 37 calls were trading for $0.50. 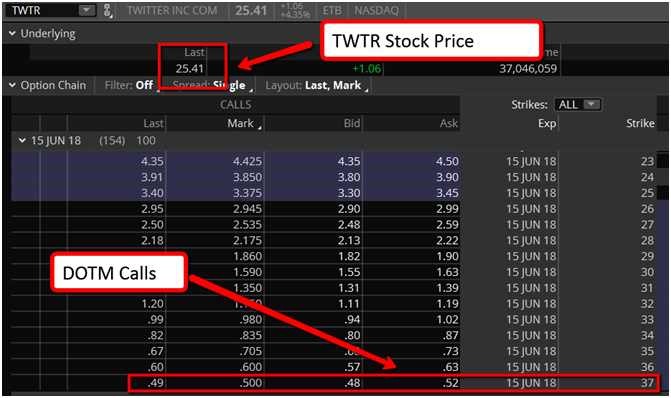 By summer those same calls were trading for $8.80! That’s an incredible 1600% return. A $1,000 position in this option turned into $16,600 in only 5-months. Since Taleb’s Black Swan was first published just months before the GFC, traders have been mindlessly buying put options in the hopes that another “left tail” event is around the corner. But it’s been the wrong strategy. Since 2008 all of the outlier returns have actually occurred in the right tail. 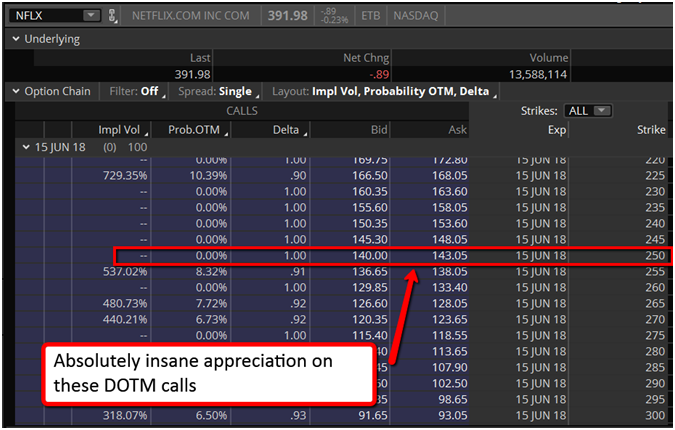 Here is yet another example of an extreme right tail return out of NFLX in the DOTM calls. 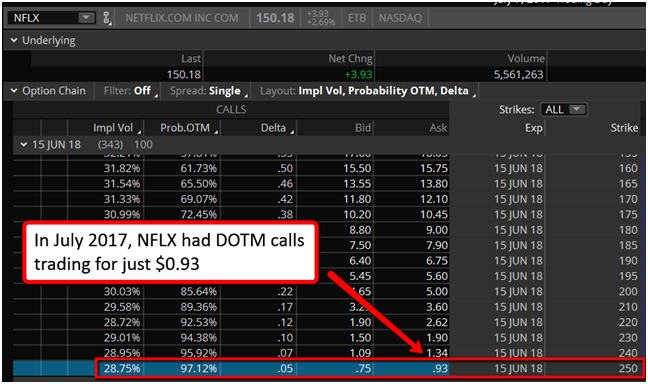 NFLX had DOTM call options trading on July 7th 2017 for $0.93. At expiry on June 15th 2018, these DOTM calls were trading for $141.00…See ‘em on the option chain below. DOTM calls on momentum stocks are producing once-in-a-decade returns every year. Returns of this magnitude shouldn’t happen this frequently. But they do because the Black-Scholes model isn’t equipped to properly value DOTM call options on high momentum names. The key to executing this strategy successfully relies on finding strong, high-momentum stocks that can trend well past the strike prices of the DTOM calls. If you buy DOTM calls on the wrong underlying, like an equity index or a commodity, you’ll just rack up losses and the winners won’t be big enough to make up for it. This strategy only wins because of the magnitude of the winning trades. It’s all about realizing that right tail return and ringing the register on a 50 bagger. Focusing only on individual stocks with the following characteristics has helped us identify the best candidates for DOTM call buying. Stocks that have been performing well in the recent past have the highest probability of continuing perform well into the future. You can run a momentum screen and find what stocks have the best 6-month and 12-month returns. Focus on those. What’s even better is if the stock is also in a sector that has been outperforming the broad market. So narrow the scan down to the strongest stocks in the strongest sectors. Finally, if you look at the chart and see a clear break higher from a congestion zone, that’s an added bonus. 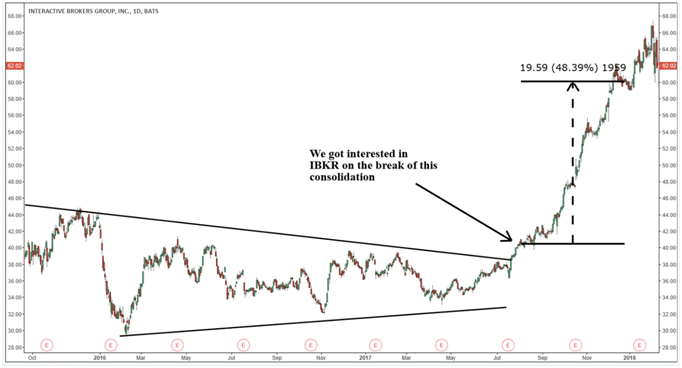 Breakouts from consolidations act as technical catalysts that propel a stock higher and none of the trend is yet priced into the options. It’s not enough to simply scan for positive price momentum. The fundamentals should support higher prices as well. From a fundamental perspective we like to see growth potential that can exceed the market’s current expectations. The sweet trends of the FAANG stocks occurred because market participants vastly underestimated their growth potential. Usually, these high momentum stocks will have strong rates of revenue and free cash flow growth. If you see negative numbers for either of these skip the stock and go onto the next one. Finally, a strong fundamental catalyst that the market is fixated on helps to keep the hype train moving and the trend rocketing higher. Something like a large earnings beat or a new product launch is always good. After finding a quality momentum candidate we do a quick check on the listed options.Two things matter here, the implied volatility and the liquidity. Implied volatility isn’t hugely important for this strategy, our focus is betting on direction. But it’s still worth paying attention to. High implied volatility makes it tougher for the stock to exceed the strike price of the DOTM call option. In the graph below, notice how the red line (high IV) is higher than the blue line (low IV). If the IV gets too high, the cone widens so much that even a strong trend in the underlying stock can’t breach the strike price of our DOTM calls. We’ve found the sweet spot for IV is anything lower than 40%. 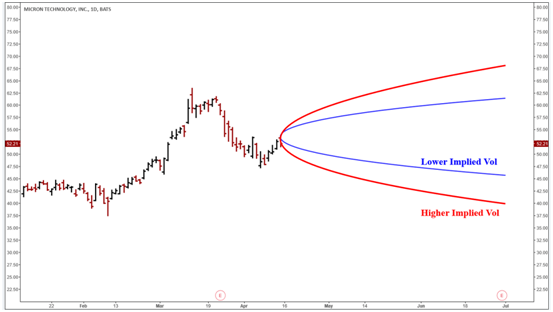 Below 40% keeps the option strike close enough to the stock so that it has a realistic chance of outperforming the implied move of the Black-Scholes model. After IV we check liquidity conditions. The stock has to have tradable options both far out in time and far away from the strike price. The call options need at least 100 days of expiry let in them and a delta of 15 or less. 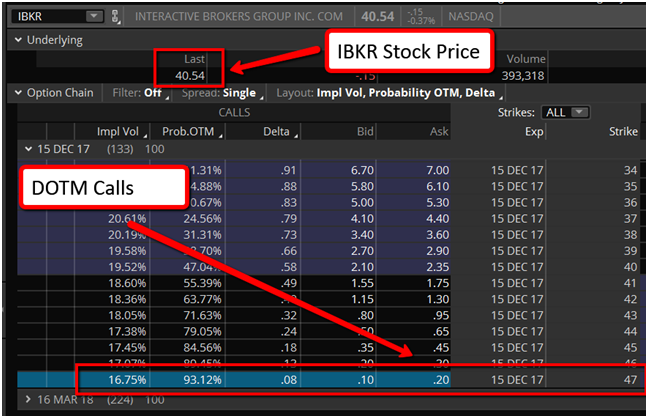 You can see in the example below that IBKR is trading for $64.46. The options of interest are the ones with a strike price far away from $64.46. The red rectangle shows DOTM calls struck at $85 and $90. Also notice that these DOTM calls are much cheaper than the ones closer to the current stock price. 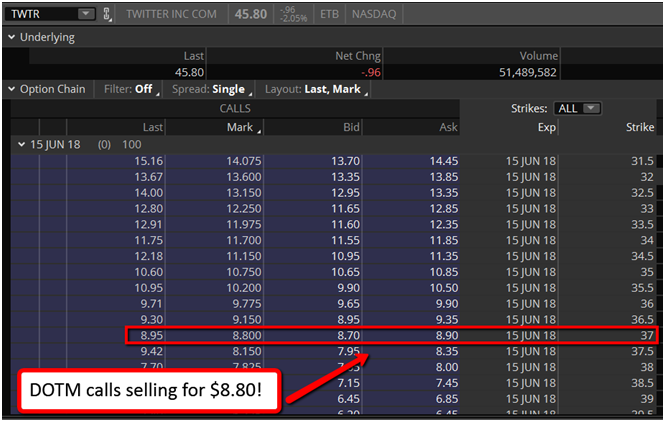 The 90 call in this example trades for $.80. The 65 call trades for $5.60 — 7 times more expensive. DOTM calls have more positive asymmetry versus the ones that are closer to the money. Finally, if the bid ask spread looks reasonable then we’ll pull the trigger on the DOTM call. From there it’s all about letting Mr. Market do it’s work. In our experience, when it comes to managing a DOTM trade, less is more. We like to run our DOTM calls to expiry without management and just accept whatever the market chooses to give us. Most of the time that’s a goose egg — remember, this is a very low win rate strategy. But, every once in awhile we’ll get a 50-bagger that pays for all of our losses and much much more. There you have it! That’s the DOTM call strategy in a nutshell. This is one of many strategies that we implement in the Macro Ops Portfolio. If you would like even more information on our DOTM call strategy you can learn more by downloading this free DOTM guide by clicking here. Tyler Kling is the co-founder of Macro Ops, a trading community focused on the art of global macro. 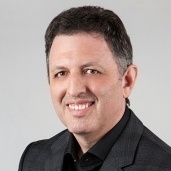 He is a former trade desk manager at a $100+ million family office where he oversaw multiple traders and created quantitative trading strategies for options and futures. Tyler also worked as a consultant to the family's in-house fund of funds in the areas of portfolio manager evaluation and capital allocation. He holds a Certificate In Quantitative Finance from the Fitch Learning Center in London, England where he studied under famous quants such as Paul Wilmott.